Not so long ago I had the good fortune to spend two days in Venice. On the first day I toured the city with a group of my travel agency’s clients. They left the following morning but I stayed for an extra day. A day to explore Venice! I’ve been there several times so I’ve seen the famous places including St. Mark’s Basilica and Square, the many other beautiful churches and the Rialto bridge. I wanted to use this day to explore the “real” Venice, the places where ordinary people have lived for many centuries. 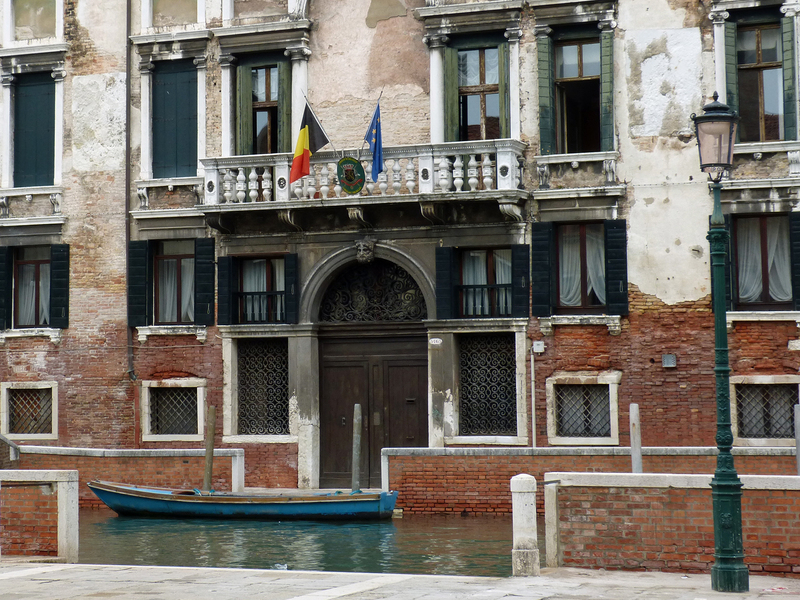 This formerly grand mansion in the Dorsoduro section of Venice is now likely divided into apartments. 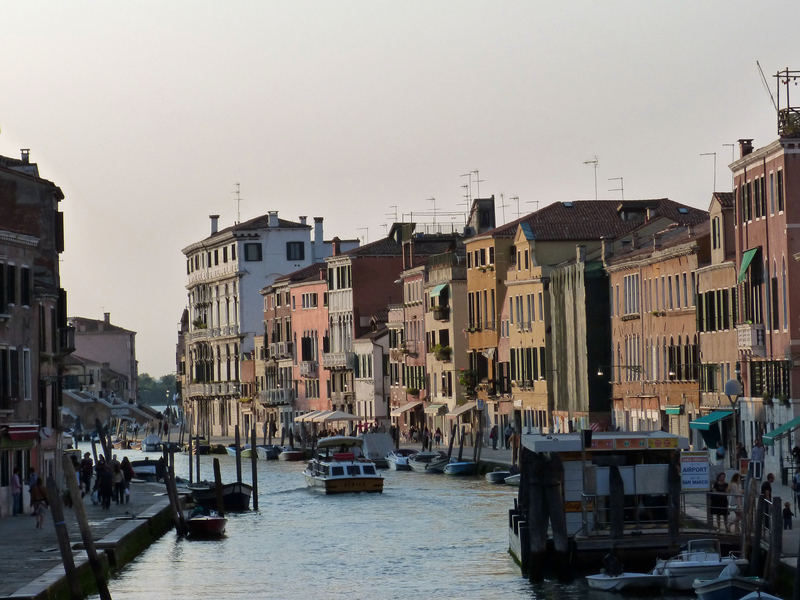 I began my explorations in the southwest corner of Venice, in an area called Dorsoduro. I’d read a good book (Miss Garnet’s Angel by Salley Vickers) which is set in one corner of this neighborhood. In the novel, a recently retired British school teacher rents a small apartment in Venice for the summer. The area where Miss Garnet stayed plays an important role in the book. In seeking the square and the churches described in the novel, I discovered a small street market, many ancient houses – some grand, some not – along the canals, and beautiful small churches. 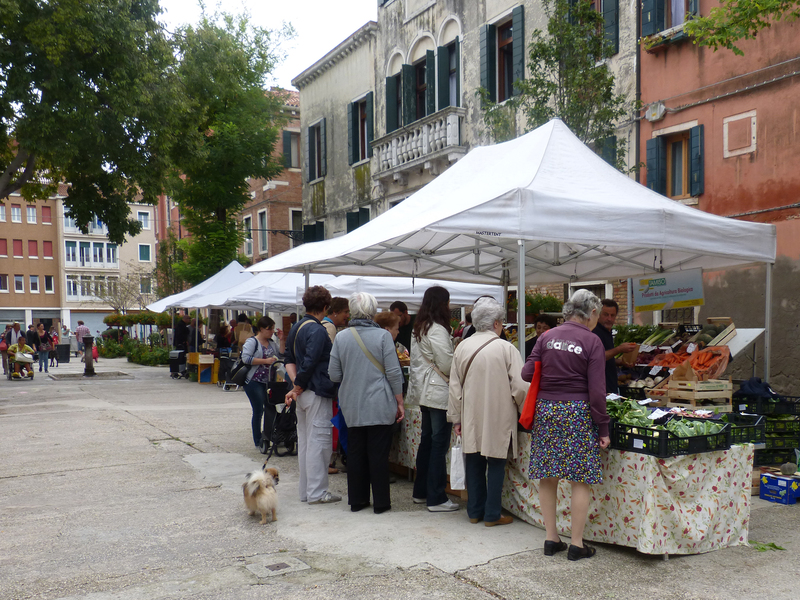 A small daily market on a large square in the Dorsoduro neighborhood. My next stop of the day was Burano, a tiny island in Venice’s lagoon. The ferry that goes there also stops at Murano, the island of glass factories popular with tourists. Burano is traditionally an island home of fishermen and their families. Today it may be best known for its brightly colored houses. As in Venice, people in Burano own boats, not cars. Canals lace the island, crossed by lovely old bridges. Laundry flies from the upstairs windows of many apartments. A tall church tower leans precariously. Old cafés are filled now with tourists. I enjoyed a perfect afternoon there with my camera. 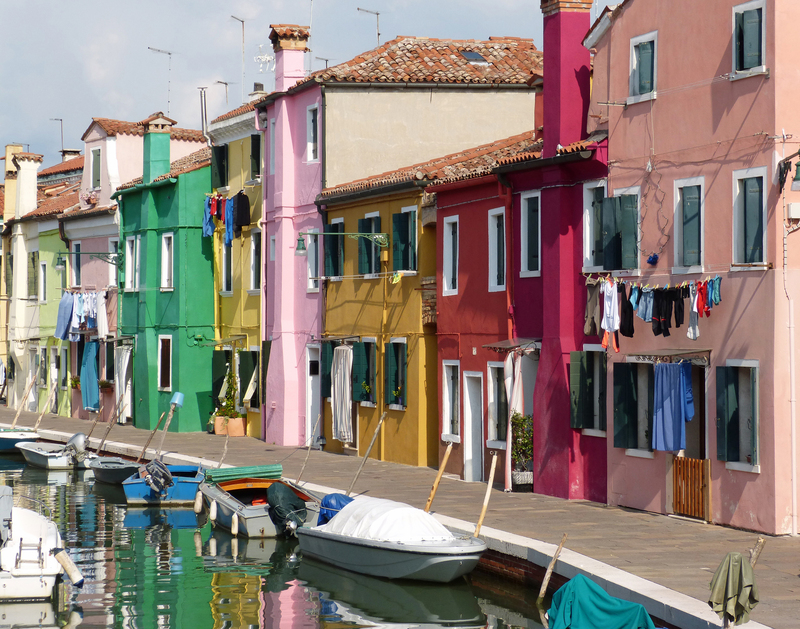 A typical “street” in Burano is a canal lined by colorful houses draped in laundry. 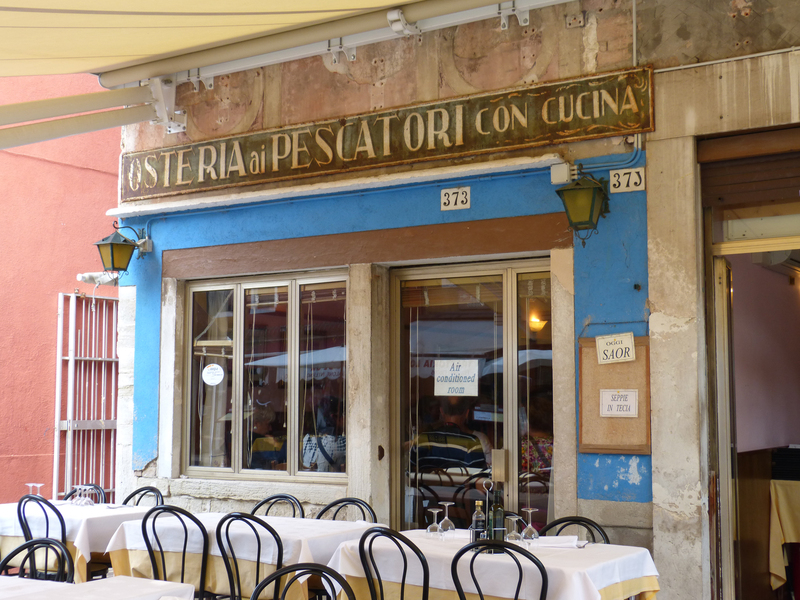 An old, small seafood café in Burano. When I returned to Venice the sun was low in the sky. The ferry docked in the northeast corner of the city, in a neighborhood called Cannaregio. A late afternoon market served people on their way home from their jobs. Cafés lined the streets. I found an old synagogue just opening that Friday evening. I remember the gelato cone I enjoyed there. It was a comfortable place to end my day exploring Venice. I had rediscovered the enjoyment to be found exploring beyond the famous “must see” places in the big, old cities of Europe. Returning to Venice by ferry as the sun began to set. 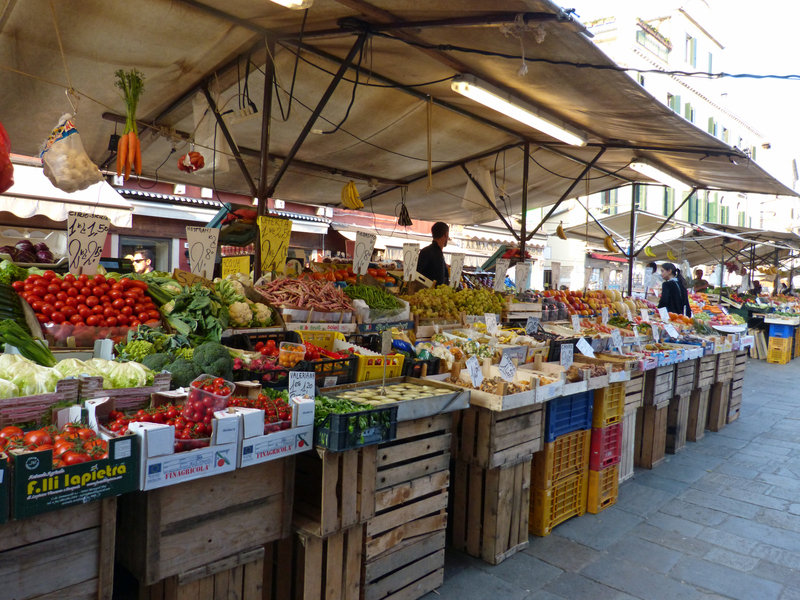 On the main square in Cannaregio, a fresh fruit and vegetable market was set up on the crates that carried the produce. I have been reminded of that day twice recently by conversations with my friends Carole and Linda about their experiences in Venice. I’ve asked each of them to write about their time there for this blog. I’ll be posting their recollections within a few days. 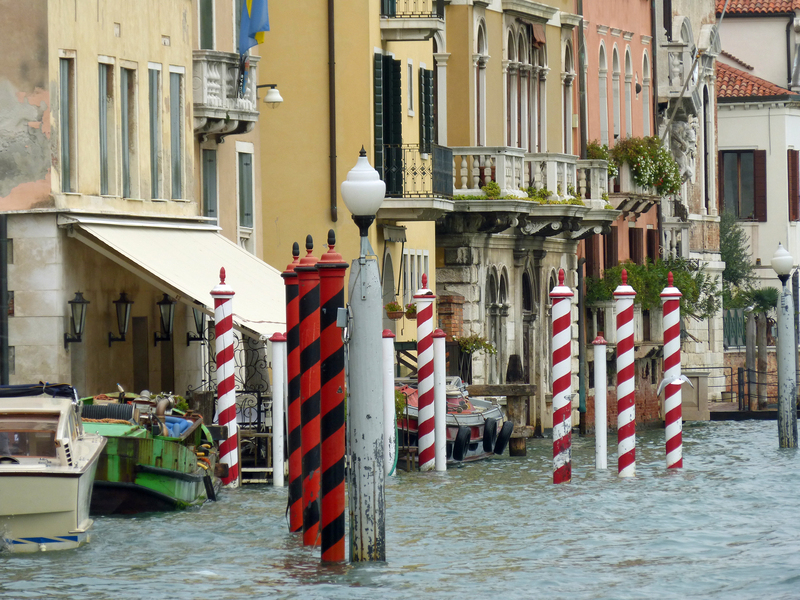 This entry was posted in Italy, Venice by Libbie Griffin. Bookmark the permalink. Bob and I just spent 5 days, 4 nights there and loved it. The only negative is the sheer volume of tourists. When we there in early May there were 4 enormous cruise ships and several small ones docked on the outskirts. By 10 am the St. Marks dock area was crammed. Barely able to walk over the charming small bridges. We chose not to take a gondola ride because with the number of tourists it was more like bumper cars. Despite all this, we were charmed. Loved getting lost on the small winding streets. 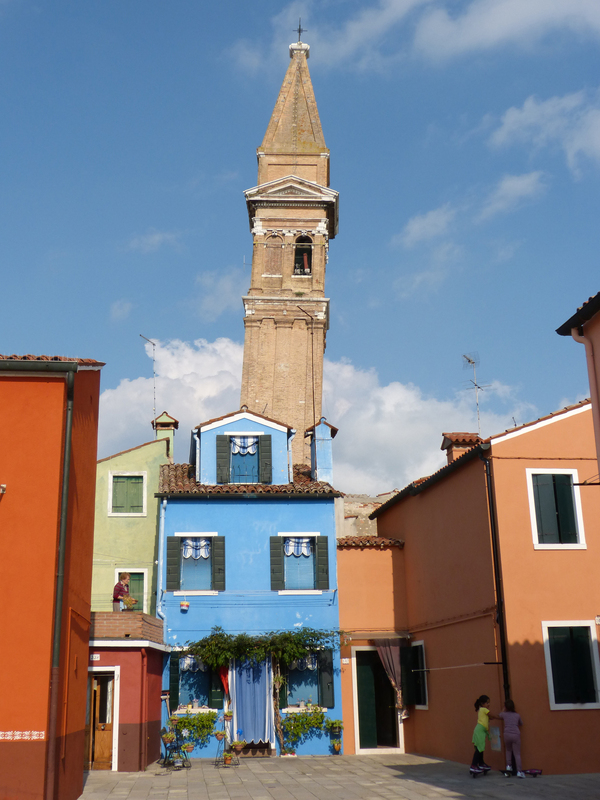 We too went to Burano and also the little nearby island of Torcello. A fairly long, but thoroughly enjoyable, vaparetto ride. We went on a Sunday and again the crowds were overwhelming. I think a different day would have made a more tranquil experience. Love your pictures.